The Emergency First Aid at Work for Drivers Level 3 course (EFAW) is designed as a ProTrainings CPD certified qualification, all courses are delivered, evaluated and quality assured to meet the new guidelines set out by the HSE in October 2017 and meet the requirements of the First Aid at Work (First Aid) regulations 1981 and subsequent changes. All our first aid courses fully meet the UK and European Resuscitation Council Guidelines 2015 as per the HSE requirements. The 2015 guidelines are the latest guidelines available. This course meets the JAUPT requirements for CPC if run through an approved JAUPT centre. ProTrainings Vocational Training Qualifications (VTQ) are fully recognised by the HSE as Trade Body Qualifications. 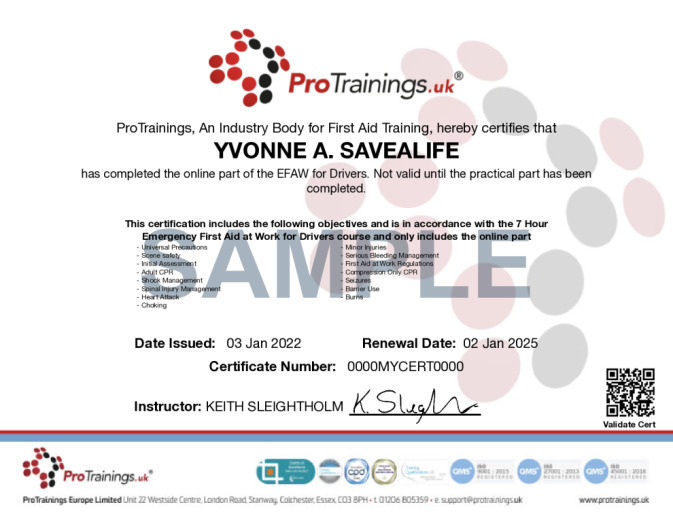 This blended EFAW course meets all of the requirements under the HSE and Awarding Organisations and is available as a ProTrainings or Regulated Qualification. This qualification is accepted in England, Wales, Scotland and Northern Ireland. It is also accepted in many other countries. This course comes with 4.0 hrs (8.0 class) of CPD, although the time to complete the course online may be less than this. Total course time includes 3 hours and 21 minutes of video training as well as knowledge reviews, final test, remedial help and reviewing downloaded material.